On the way up you can see quite good view of the Hawaii Kai side and the ocean but as the path gets steeper be sure to keep soldiering on as the view from the top is one of the best views I have seen in Hawaii. There are other harder hiking trails that end up along the same general ridge area but none of them are as safe and easy as the Kamehame Ridge trail. 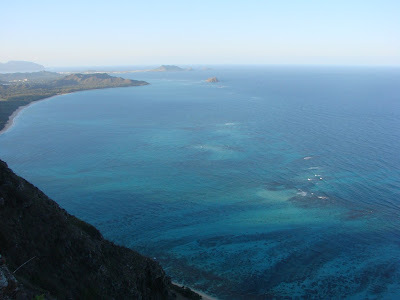 As you can see there is a spectacular view of the Waimanalo side of Oahu. You can see the beaches and the reefs and just a wide expanse of ocean. You may also find it well worth it to bring a pair of binoculars on this trail. Be sure to also check out my Kamehame Ridge Summit Video. Today we start our Kamehame Ridge series. These photos were taken on Bob’s January full moon walk. 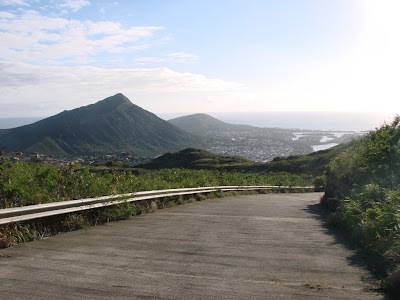 The trail starts at the end of Kamehame drive in the Hawaii Kai area on the southeaster side of Oahu. The trail is around 1.5 miles up a sometimes steep and sometimes potholed paved path. This photo was taken a few minutes into the hike. The trail itself has little shade so if you go during the day be sure to bring plenty of water and sunscreen. As you will see the view at the top is worth the climb. 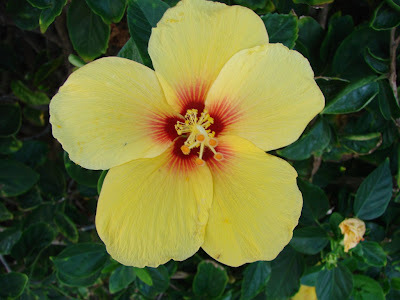 Here is a photo of a yellow hibiscus flower. As many visitors to Hawaii know the hibiscus is a common sight in Hawaii and some of the prettiest flowers. It is part of the flowering plants in the mallow family and thrives in tropical regions. I particularly like how the yellow of this flower contrasted with the dark green leaves. I hope everybody is having a great weekend be sure to return on Monday as we start a Kamehame “hike” series.